Alfred W. McCoy. Closer Than Brothers: Manhood at the Philippine Military Academy. New Haven: Yale University Press, 1999. 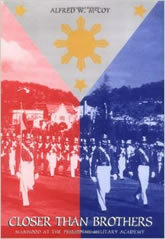 In this innovative book, Alfred W. McCoy takes a new approach to the military and political history of the Philippines. Comparing two generations of graduates from the Philippine Military Academy (PMA)—the classes of 1940 and 1971—McCoy uncovers fundamental differences in their academic socialization and subsequent ascent to power. Viewed through this comparative lens, the story of these two classes becomes the history of the entire Philippine army, offering important insights into the complexities of Filipino involvement in war and peace from the 1930s to the 1990s. Drawing on extensive interviews with these officers, as well as on diaries and memoirs, the book details for the first time activities of the secretive brotherhood that is the Filipino officer corps. Members of the class of 1940, who bonded to one another in PMA training modeled after West Point’s, emerged from heroic battles against Japanese invaders with their belief in civil supremacy over the military affirmed. In postwar decades, they actively blocked coup attempts. By contrast, the class of ’71 emerged from the academy to become the fist of the Marcos dictatorship. Their involvement in torture ruptured the academy’s socialization and inspired them to launch six coup attempts in the late 1980s. The collective biographies of these officers offer insights not only into Philippine history but also into topics of wider global import—the influence of male gender on a distinctly gendered institution, the causes of coup d’état, and the collective trauma of torture.